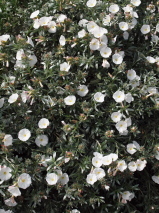 Attractive low perennial, forms a compact rounded bush with glossy silvery-grey foliage. 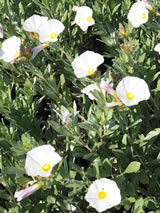 Great masses of showy white, open trumpet flowers cover bush through the summer months. Prefers warm sunny sites, with nwell drained light soil. Avoid heavy frost, and too much water. Good for warm sunny banks and garden edges. Frost hardy / Grows in sun or semi-shade / Tolerates coastal sites / Tolerates exposed sites.